Wrinkles and lines can get you down. If you feel discouraged when you look in the mirror, take heart. This concentrate is designed to help your skin look and feel silky-soft and smooth for a look that takes your beauty to the next level. Ingredients: C12-15 Alkyl Benzoate, Isononyl Isononanoate, Phenthyl Benzoate, Ethylene/Propylene/Styrene Copolymer, Butylene/Ethylene/Styrene Copolymer, Dipalmitoyl Hydroxyproline, Laurocapram, Guaiazulene, Zingiber Cassumunar Root Oil, Fragrance (Parfum), Amyl Cinnamal, Benzyl Salicylate, Citronellol, Geraniol, Hexyl Cinnamal, Butylphenyl Methylpropional, Limonene, alpha-Isomethyl Ionone. Love this product. I am 73 and people remark that I have few wrinkles. I even like the very slight scent.I notice that when I put on bare minerals after applying it, they seem to bond together and so the bare minerals last all day. It takes a little extra washing to remove. I purchased this based on reviews and at 65 years sagging is definitely my biggest issue! I mix one pump with my Prai firming and lifting face cream and press it on my skin and my face and neck is definitely firmer. It is very moisturizing and softening of my fine lines! This is a really great addition to my aging skin care regime. I always purchase from Prai when they have special pricing it really helps my budget and I get to have luxury, quality and effective powerful skin care! 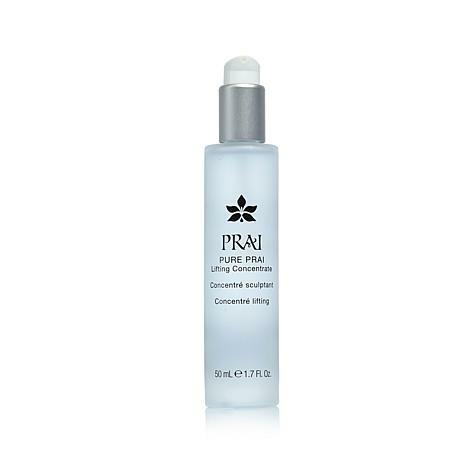 I have used the Prai Pure Prai Lifting Concentrate for about 2 months. 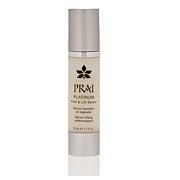 I use it in conjunction with the Prai 24K Gold Wrinkle Caviar Serum and the Prai 24K Gold Concentrate Retinol + products. I have noticed that the skin along my chin line is tighter and has less sag than before I began using this product. A little goes a long way, and it dissolves easily into your skin without leaving your skin feeling oily. I encourage you to try it. It will definitely stay in my skin care regimen. Amazing product! Works fabulous! Lasts forever! Goes on nicely and you don't need much. Fills in the fine lines on my face and no burning or itching or side effects. I love it.